WASHINGTON (CNN) -- Federal authorities have charged seven men in North Carolina with supporting terrorism and conspiracy to commit murder abroad, the Justice Department announced Monday. Officials said one of the men, identified as North Carolina resident and U.S. native Daniel Patrick Boyd, had traveled to Pakistan and Afghanistan, where he trained in terrorist camps to carry out "violent jihad." Boyd, 39, who went by the name Saifullah, was charged along with two of his sons: Dylan Boyd, 22, also known as Mohammed, and Zakariya Boyd, 20. The four others also are residents of North Carolina, and all seven are accused of engaging in weapons training and military tactics in their home state, the Justice Department said. "We consider this significant. We've been watching them for some time, and we think they were dangerous," said a federal law enforcement official who asked not to be identified. The Boyd family and defendant Mohammad Omar Aly Hassan are identified as U.S.-born citizens. Defendant Hysen Sherifi is identified as a native of Kosovo who is a legal permanent resident of the United States, and Hiyad Yaghi and Anes Subasic are said to be naturalized U.S. citizens. Officials did not immediately identify their native countries. The indictment, made public by the Justice Department, says Daniel Boyd and others left the United States for Israel in June 2007 to "engage in violent jihad but ultimately returned to the United States after failing in their efforts." The defendants, with a substantial cache of weapons, had "practiced military tactics and use of weapons on private property in Caswell County, North Carolina, in June and July 2009," the indictment says. The documents make no reference to a direct threat to individuals or property in the United States. In a written statement, the Justice Department's top counterterrorism official, David Kris, said that Daniel Boyd, "a veteran of terrorist training camps" had conspired with others to recruit and help young men travel overseas in order to kill." The U.S. attorney in Raleigh, George E. B. Holding, said, "These charges hammer home the point that terrorists and their supporters are not confined to the remote regions of some far-away land, but can grow and fester right here at home." 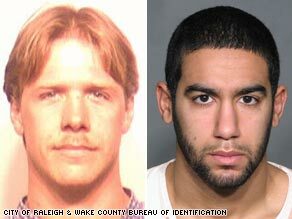 The defendants made an initial appearance in federal court in North Carolina. Officials said they are expected to return to court Thursday for detention hearings.